Chelsea have reportedly been forced to accept they’ll have to negotiate over Eden Hazard’s potential transfer to Real Madrid in the summer. The Belgium international has seemingly made it clear he doesn’t plan to sign a new contract at Stamford Bridge, with the club aware he wants to leave for Madrid, according to Marca. 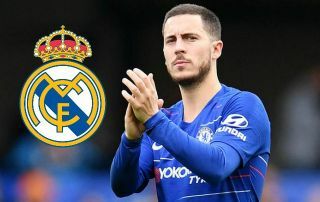 The Spanish outlet suggest Hazard is edging ever closer to becoming the next big-name signing at the Bernabeu – one that looks badly needed after the club’s failure to replace Cristiano Ronaldo after his move to Juventus. Hazard is one of the best attacking players in the world and seems an ideal fit for Los Blancos, but this looks a devastating blow for Chelsea. The Blues lost Thibaut Courtois to Real last summer as well, and are now in a situation once again where they’ve allowed a player’s contract to run down, weakening their negotiating position. Marca claim CFC will now ask for around £88million for Hazard, which Madrid will no doubt feel they can try and lower. Still, one imagines if he weren’t so close to the end of his contract, Chelsea could ask for close to £200m for a player of the Belgian’s quality.